But the new climate denier EPA administrator is wrong about his “opinion” about the science of climate change. Let’s look at just how wrong Scott Pruitt is about the science of climate change. Don’t expect this page to be here much longer, but the EPA appears to be solidly behind climate change. Obviously, Scott Pruitt is wrong about climate change just based on what his own department, which used to be run by real science, says about the real science of climate change. A scientific consensus isn’t some small group of scientists outside of the mainstream of a particular field. On the contrary, it results from the top scientists in the world, examining the wealth of evidence, forming a collective opinion and judgement in a particular field of science. This consensus implies general agreement, and disagreement is limited and generally insignificant. The scientific theory of anthropogenic (human-caused) global warming is based on widespread evidence and that collective judgement of the top climate scientists. Scott Pruitt is falling for the argument of false equivalence. He wants us to believe that a few dissenters, many of whom lack any serious credentials in climate science, geology, paleontology or any field relevant to climate change, is somehow equivalent to the massive consensus supporting climate change. Pruitt only looks for evidence or arguments that supports his preconceived notion that climate change isn’t real, while ignoring the vast evidence that says he’s wrong. We see this a lot in science deniers, so not a big surprise. Referring to the best website on climate change (and one of the best websites on science, period), Skeptical Science, the individual pieces of evidence supporting human caused climate change is literally mountainous. Let’s look at some of it. surface temperature stations and satellites measuring the temperature of the Earth’s surface and lower atmosphere. measurements of the warming of the Earth’s oceans. satellite measurements of an energy imbalance at the top of the Earth’s atmosphere. receding glaciers, sea ice, and ice sheets. earlier arrival of spring each year. Within each of those broad statements are thousands of robust data points that support the claim. For example, the earlier arrival of spring isn’t just measured by temperature, but also by the movement of animals, flowering of plants, and amount of snow cover. Despite some ridiculous claims, global warming hasn’t stopped. It continues on its march to a hotter and hotter planet. Data, and graphs of that data, show a continued progression of a warmer climate from the 1970s and 1980s through to 2016, which was considered the warmest year on record, according to the NOAA (National Oceanic and Atmospheric Administration) and NASA. The warming trend continues, almost unabated. Four Hiroshima atomic bomb detonations per second. Think about that. There are a number of lines of evidence which clearly demonstrate that this increase is due to human activities, primarily burning fossil fuels. The most direct of evidence involves simple accounting. Humans are currently emitting approximately 30 billion tons of CO2 per year, and the amount in the atmosphere is increasing by about 15 billion tons per year. Our emissions have to go somewhere – half goes into the atmosphere, while the other half is absorbed by the oceans (which is causing another major problem – ocean acidification). We also know the atmospheric increase is from burning fossil fuels because of the isotopic signature of the carbon in the atmosphere. Carbon comes in three different isotopes, and plants have a preference for the lighter isotopes. So if the fraction of lighter carbon isotopes in the atmosphere is increasing, we know the increase is due to burning plants and fossil fuels, and that is what scientists observe. The fact that humans have created, and continue to create, greenhouses like CO2 approach what we call a “scientific fact,” that is, a repeatable and careful observation or measurement (using the scientific method) that forms the basis of a scientific theory, one of the most comprehensive forms of scientific knowledge. That humans caused this increase in CO2 is settled, it’s not subject to false arguments. Based on fundamental physics and math, we can quantify the amount of warming human activity is causing, and verify that we’re responsible for essentially all of the global warming over the past 3 decades. The aforementioned Foster and Rahmstorf (2011) found a 0.16°C per decade warming trend since 1979 after filtering out the short-term noise. There are also numerous ‘fingerprints’ which we would expect to see from an increased greenhouse effect (i.e. more warming at night, at higher latitudes, upper atmospherecooling) that we have indeed observed. Observed ‘fingperprints’ of man-made global warming. From Skeptical Science, 2010. Climate models have projected the ensuing global warming to a high level of accuracy, verifying that we have a good understanding of the fundamental physics behind climate change. Sometimes people ask “what would it take to falsify the man-made global warming theory?”. Well, basically it would require that our fundamental understanding of physics be wrong, because that’s what the theory is based on. This fundamental physics has been scrutinized through scientific experiments for decades to centuries. These fingerprints of global warming are enormous and, factually, are incontrovertible. It’s almost at a point to deny this science is no longer some form of ignorance, but it must indicate some social disorder. But then again, how many times do we see Dunning-Kruger cognitive bias when it comes to science? So there you have it. We have substantial evidence that global warming is real. We have evidence that it continues today. We have powerful evidence that humans are the largest contributor to greenhouse gases. And we know that greenhouse gases cause global warming. That’s a really robust chain of scientific evidence, accepted by the leading scientific minds of our world. To deny this science would mean you have an equivalent amount of powerful evidence from the best scientists in the field. I wonder if Scott Pruitt has some access to secret scientific research produced at the Attorney General’s office in Oklahoma. Because none of us have seen any data that would push us to conclude that global warming does not exist, nor that humans have not caused it. I know I’m “preaching to the choir” here. 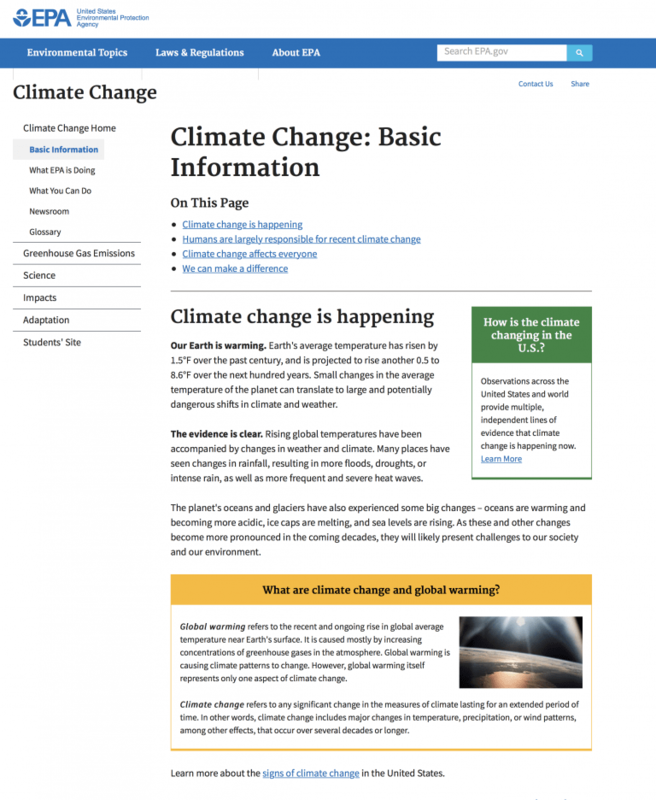 I realize most people who visit this blog come for the science, and accept that people smarter than you and I have established the scientific facts of climate change through evidence and logic. Maybe a few pretty graphs and scientific reasoning will appeal to one or two Trump supporters. It’s sad that Scott Pruitt, who’s going to run an important agency to control climate change, relies on opinion and science deniers to support his predisposed conclusions about climate change. But he’s simply wrong. The science on climate change is overwhelming. The scientific consensus, based on that evidence, is overwhelming. Read this science deniers – climate change is real and is caused by humans.